Did you know that Artemesia is a plant that can grow in Kenya and from one plant 500 people can be cured from the malaria disease? Well I didn't and I find it amazing! People can plant it in their garden especially those that can't afford to go to the hospital, poor people living in rural areas and use it to be treated from malaria. According to the World Health Organisation (WHO), Artemesia can treat 100% the malaria disease. 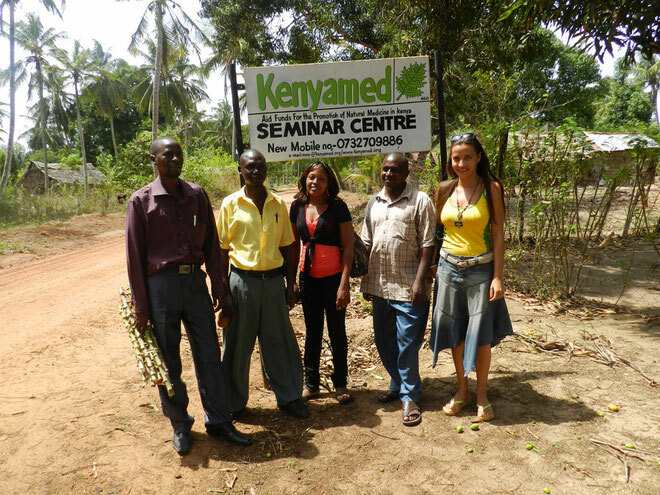 Kenyamed is a farm project run by Margarete Mainka-Ruprecht and her team in Kenya. There they grow plants such as the Artemesia plant for medicine. If you have read my previous blog you will already know that we were planning to go with our staff for a training in farming so they can get ideas of how to grow and preserve fruits,vegetables in our garden and so we did. It was Friday morning and all the staff arrived on time at the school to head to Kenyamed farm for the training. We didn't know where it was so we took 2 motorbikes the four of us asking around the village for directions. The farm is at Mtpoeni area not far from Mtwapa and the distance from our school is about 15 minutes with the motorbike. When we arrived one of Kenyamed's staff Peter came to the entrance and greeted us warmly. The farm is very big and I was looking around to see all the plants I have heard that they are planting for medicine. Of course as I don't know many things about plants I could not tell the difference from one plant to another - ok maybe just the leaves. Once we are seated at the rounded table in the middle of Kenyamed's farm for the introduction I couldn't help myself and started asking Peter about their project and what they do. He explained to me that they mainly grow plants that they can be used for medicine as an alternative of using drugs from the chemist. Also they are running seminars around the country and train staff of other organizations to use certain plants for medicine. Our discussion slowly turned into the reason we visited the farm and started talking about KARIBU care garden and what we grow. One of our staff Willy that he is growing the plants in our garden he struggles sometimes growing specific vegetables and came up with many questions of why some plants are not growing, what type of insects kills them and how to protect them, what soil we should use etc. Peter gladly and very easily answered all of his questions. He identified the insects that Willy was describing and explained why he believes some of our crops and seeds don't grow in our soil and made suggestions. Peter later took us around the farm where we could actually see all their plantation such as the guava tree, aloe vera, eucalyptus, green vegetables, moringa, hibiscus, artemisias and explained to us the benefits of using these for treatment such as malaria, headaches, fever, diarrhea etc as an alternative of using drugs. At the end of the training we had a task to do. To plant our own vegetables using a sack! Yes a big sack. For those that don't have a big garden you can just take a sack fill it in with soil and in the middle put stones so the water can flow through the sack. It was a great experience and now our staff are ready to apply all what they have learned into our garden. We will keep you updated of the progress of our garden. Here are some more photos from our visit to Kenyamed.